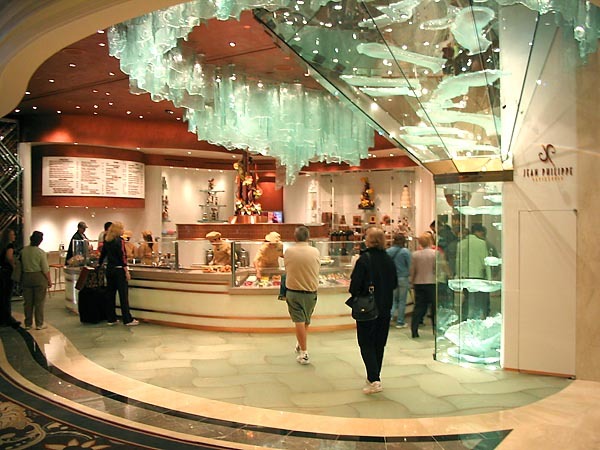 This past weekend, after a month of construction delays and intense kitchen preparation, the new Jean Philippe Patisserie opened in Bellagio, Las Vegas. When I started in the pastry kitchen about 10 months ago, all we could see was a freshly designed logo and rough sketches of the interior. Now we're all working our asses off pulling lots of overtime to fill the cases with beautiful pastries (please, come and help us!). Congratulations to Chef Maury, Chef Claude Escamilla (who designed all of the dessert pastries), and my boss Chef Chris Hanmer (who keeps the team on track and works harder and longer hours and any of us). The Man and his new baby. The front of the shop is on the hallway leading from the Conservatory to the new tower. This will be the "chocolate waterfall". It's not quite finished yet, but it should be running by next week. A variety of packaged goodies - cookies and candies - ready for takeaway. 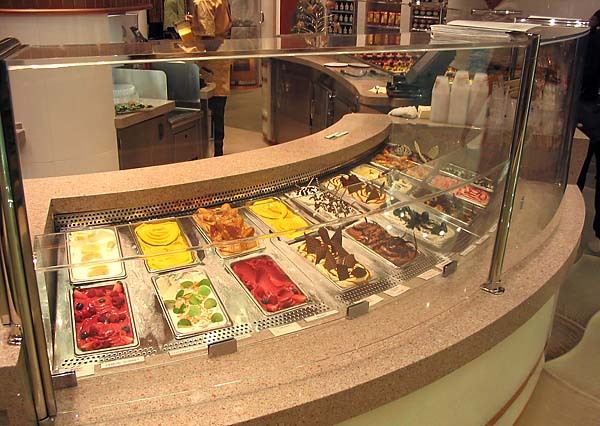 The ice cream is made in-house, of course. The made to order crepes have been extremely popular. Both savory and sweet fillings are available. 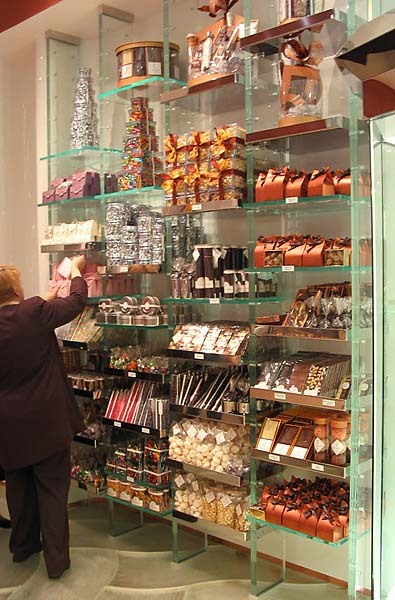 The full line of chocolates. The packaging is all custom and very elaborate. 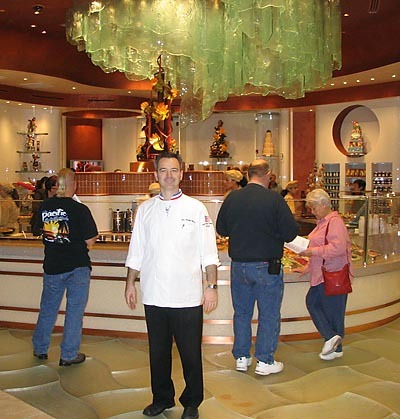 Yes, that's a chocolate showpiece on top of the case. 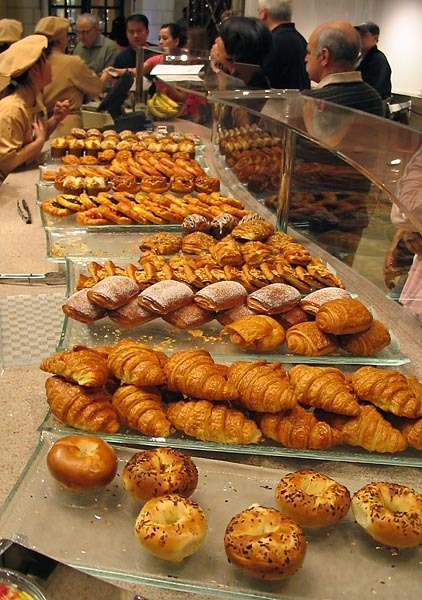 Croissants, danish, and other breakfast pastries. 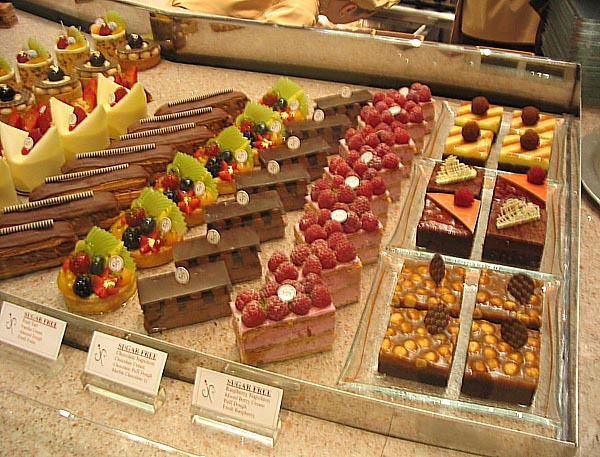 Of course, the highlight is the dessert pastries. 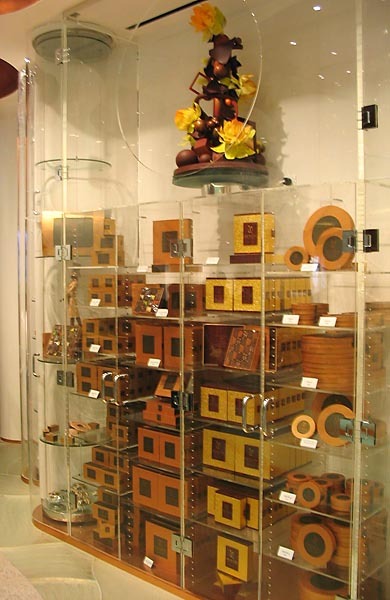 All items in this display are $5.50 each. I woke up in a bad mood this morning (repeatedly awoken last night) and you just made my DAY Neil! How gorgous!!!!!!!!! I want to taste everything! Are they selling anything online? I wouldn't want to be the person that has to clean out that chocolate waterfall if your temp. drops. Will you post a photo of it when it's running, please? 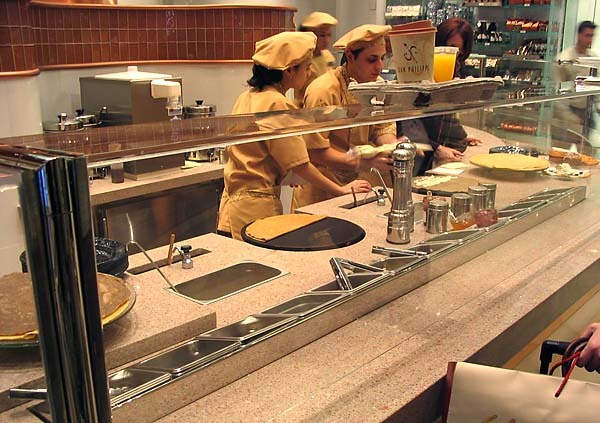 Crepes made to order..........cool, very cool. Can we ask you questions about some of the items? OMG everything looks amazing! It'll be a must see/eat the next time i'm in Vegas! And a chocolate waterfall! I thought they only exist in dreams! Beautiful looking stuff. Seeing pastry like that only makes me want to try harder. 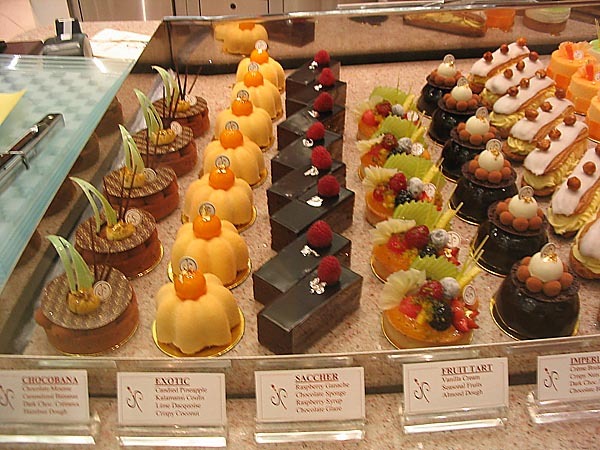 I only have one question...when did the spelling of Sacher change to Saccher, or is that some arcane version? OMG! 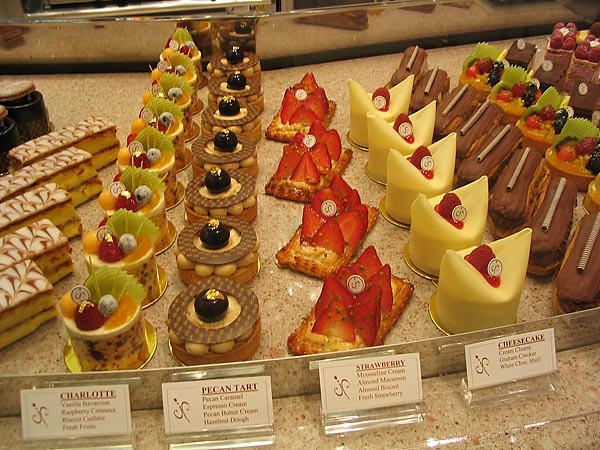 Those are some of the most beautiful pastries I've ever seen. I was trying to find one, or even six, to "order", but it's impossible to choose. Bravissimo. By the way, what sweetener are you using for the sugar-free stuff? 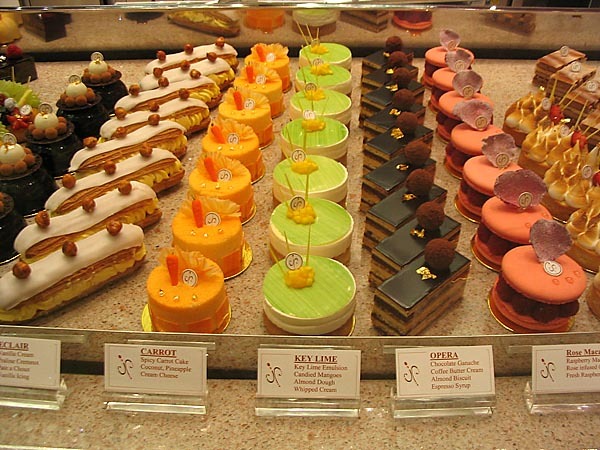 What a magical display of pastries! What artists!! What masterminds!!! There should be a drooling smiley here. Spectacular display. I am amazed at the scope of the enterprise. 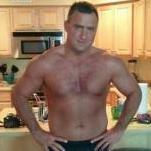 The challenge will be maintaining quality as time goes on. Nevertheless, a beautiful start. Good luck! I too want to see pictures of the chocolate waterfall. Absolutely beautiful. Did Chihuly design the art glass? 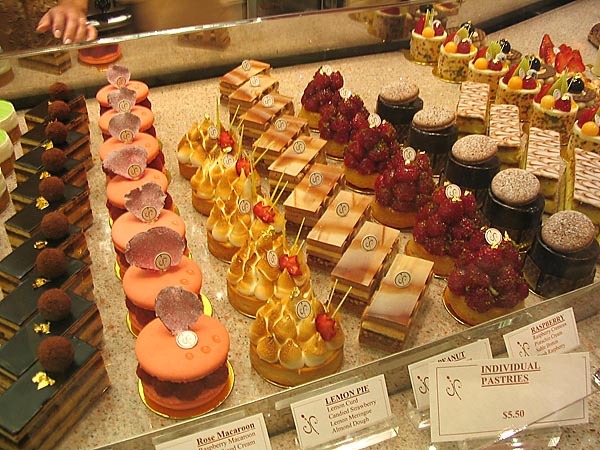 It looks like we finally have a French patisserie right here in the USA. I wish I could produce such works of art. Stunningly gorgeous! How many people are producing this each day? I'll try to answer all the questions I can, though I haven't tasted everything so I don't know full details on some items (and don't ask me which is my favorite). We use maltitol in the sugar free items. It doesn't have a nasty aftertaste like artificial sweeteners do, and though it can affect the "digestive process" if eaten in large quantities, the amount we use is quite small and we haven't had any complaints. It's been used in the sugar free desserts in the buffet for years. I don't think anything is available on-line, or if they plan to do so in the future. I would doubt it since we just aren't set up for than kind of quantity. Guess you'll just have to take a field trip to Vegas, Wendy. So far we've been making 15 of each of the dessert pastries every day, but I'm sure that will change once they see which items sell better than others. I've been spending most of my time constructing the fruit and raspberry tarts, as well as finishing the charlottes and a few other items. Our team of 5 people (plus 2 chef-supervisors and 2 afternoon production people) also has to still produce desserts for 5 restaurants and room service, as well as several other retail outlets in the hotel. Of we also get a lot of help from the danish, chocolate and production teams who produce the doughs, choux, and puff that we use. If you include the banquet and buffet teams, it's a huge kitchen. I will get a photo of the waterfall as soon as they get it working. 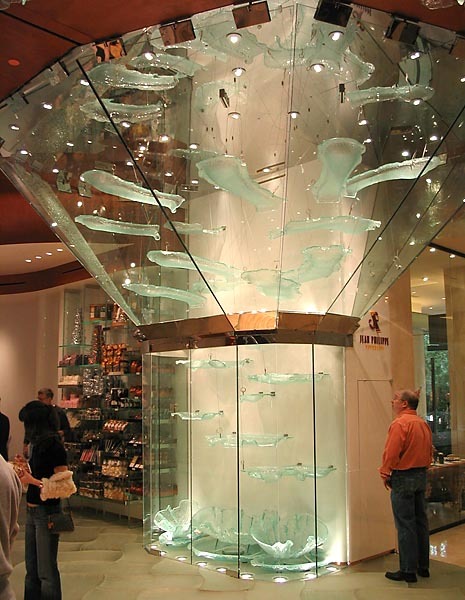 I don't think Chihuly did the glass installation - not really his style. I'm guessing it was the interior design team. I'll try to find out who designed the space. Don't know about the Sacher spelling. Maybe it's "French"? Whoa~ whoa ~ whoa ~ whoa ~ whoa!!! It's Colonel Mustard in the Conservatory with a Chocobana!!! Wow - way too cool!!! Chocolate water fall!!! Be still my heart!!! Bravo, my good man, bravo! thanks for the photos neil! the shop looks amazing. 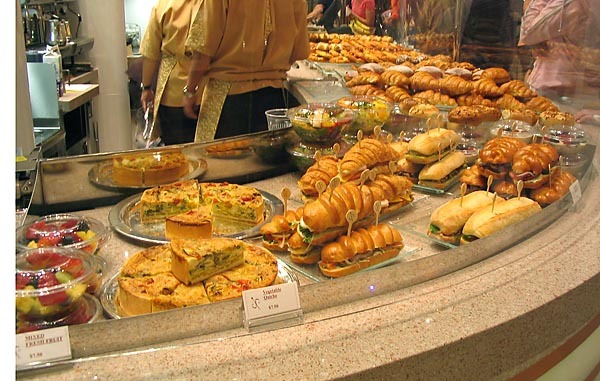 the pastries (and everything else) look flawless! i must start planning my next trip to las vegas! Can we get a picture of the waterfall when it makes it's maden voyage??? And ummm, wull you never know till you ask: could you make it a scratch & sniff too?????? Question though - If you don't mind me asking - On the fancy beautiful pastries - do you have it down to such a science that you actually will show a profit there or do the sales of other goods make up for a loss or a breakeven?? Neil, these pictures are beautiful. Thank you so much for posting them. I had been wondering if the store had opened already. It looks like we'll have to come back to Vegas despite the WPF leaving. I can't wait to see the waterfall working! Congratulations to Chef Maury and his team! Being a lowly baker (otherwise known as a pastry cook) I'm not privy to any profit and loss statements, but even if I were I'm afraid we're not allowed to talk about the business aspects of the shop or hotel in general. Sorry. I am simply stunned..... it is truly magnificent! Neil, I'm speechless. Are you loving it or what?! Neil...thanks for taking the time to post the photos. Neil Awesome job, dont ever consider yourself a lowly pastry cook. You are helping to produce some truly incredible works of edible art! Who are they getting the packaging from? Neil, your photos are of such amazing quality I can ALMOST taste those lucisous delights!.. 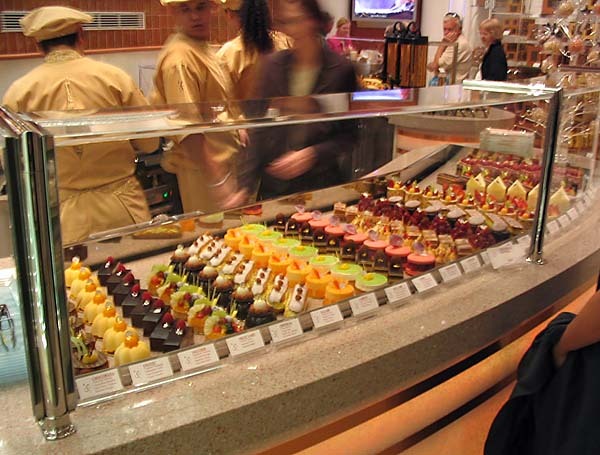 When I'm in Vegas this coming June I will definitely take a stroll to Bellagio for a small sampling. (if such a thing is possible). With so many new restaurants to try in Wynn I had planned no excursions outside the hotel but you've definitely changed my mind! I was in Vegas this weekend, and took a walk to the Bellagio on Sunday morning to check out the shop. It looks even better in real life than in the photos. I wanted to try the desserts, but made do with a chocolate croissant (excellent) and a double espresso. I planned to come back in the afternoon for some cake but unfortunately I never made it. My loss. The place was totally packed by the time I left at 8:45 a.m. or so. Most people seemed to be going for the crepes. Congratulations, Neil. You guys are doing beautiful work.